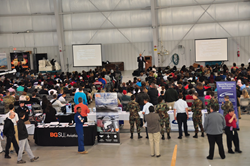 12th annual event showcases exciting careers in aviation and aerospace to over 700 students in the Mid-Atlantic Region. The Aviation Education and Career Expo is a unique opportunity for students interested in the aviation/aerospace industry to explore numerous exciting career paths and talk one-on-one with industry experts. Students get an "up close and personal” look at occupations that are in high demand in the United States and worldwide. In addition to founding sponsor ProJet Aviation, key partners and scholarship donors include: Avemco Insurance, Av-Ed Flight School, Averett University, Aviation Institute of Maintenance, Aircraft Owners & Pilot’s Association (AOPA), Air Culinaire Worldwide, Aviation Adventures, Bowling Green State University, Cirrus Aircraft, Delaware Park, Eastern Aviation Fuels, Embry Riddle Aeronautical University, Florida Memorial University, Frederick Flight Center, Geico Insurance, Greater Washington Business Aviation Association, Harris Teeter, Hoxton Agency, JetLinx, Kansas State University Polytechnic Campus, Lewis University, Liberty University, Marywood University, Middle Tennessee State University, Monroe Technology Center, Mosaix Software, Inc., National Agricultural Aviation Association, National Air Transportation Association, National Business Aviation Association, Open Air Flight School, Paragon Aircraft Detailing, Paramount Business Jets, Pittsburgh Institute of Aeronautics, Regent University, SAAB Sensis Corporation, Sharp Details, Inc., Sugarloaf 99’s, The Aviation Foundation, Toth Financial Advisory Corporation, University of Maryland (Eastern Shore), USAIG, Vaughn College of Aeronautics & Technology, and Ventus International Aviation. Registration for students and scholarship applications are online and available at the event website: http://www.aveducationexpo.com. Space is limited, and all award winners MUST BE PRESENT TO WIN. The Aviation Education & Career Expo is one of the largest and most successful aviation education events in the United States, awarding hundreds of thousands of dollars in scholarships to high school and college students pursuing careers in the aviation and aerospace industry, since its inception in 2005. Over 700 students will attend this year. The event features keynote presentations by industry leaders, static and live aviation demonstrations, and scholarship awards from universities, small businesses, and corporate sponsors. Cofounded by aviation professionals Julie O’Brien and Sarah Thompson, the Expo is committed to helping students explore the many career opportunities available to them through the world of flight. The Aviation Education & Career Expo is hosted by ProJet Aviation at Leesburg Executive Airport (KJYO), in Leesburg,VA. ProJet Aviation is the DC metro region's premier private aviation hospitality company, dedicated to helping people accomplish extraordinary things through the wonder of flight. ProJet provides an award winning flight support/FBO experience including plane-side arrival and departure services, fueling, and hangar lease at Leesburg Executive Airport (KJYO), the closest private jet airport to Washington DC, the Dulles Technology Corridor, and Virginia's Horse & Wine Country. Founded in 2007 as a partnership between former airline pilot entrepreneur Shye Gilad, and noted entrepreneur and philanthropist Sheila C. Johnson, Founder & CEO of Salamander Hotels and Resorts, ProJet’s “aviation hospitality” mindset combines the operational integrity of the world’s best airlines with the refined service of a world class resort. ProJet is the host sponsor of the annual Aviation Education & Career Expo, which provides an aviation and aerospace forum for thousands of students in the Mid-Atlantic Region, and has awarded hundreds of thousands of dollars in scholarships since its inception. ProJet’s numerous accolades include recognition as one of the top FBOs in the country in the fltplan.com Pilots’ Choice Awards, a Washington Business Journal Best Place to Work, and an Inc. 5000 Fastest Growing Company.